The most common pest bird in Houston is the pigeon. Pigeons are primarily urban birds, and they roost on, in, or around buildings. They are commonly seen on ledges, beams, store signs, under awnings, etc. They carry quite a few parasites and diseases, and they leave their droppings everywhere. 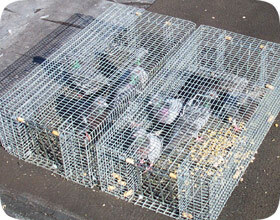 If you want to control a pigeon problem, the best way to do it is via deterrents. This means the installation of barriers such as needle strips (bird spikes) to keep the birds from landing. Other methods, such as netting, can be used in certain situations. In some cases, trapping is effective, such as seen in the photo to the right. However, pigeon relocation isn't really a realistic option. So if you don't want to kill birds, then the best way to take care of the problem is to prevent them from entering or roosting in the area. We are a professional wildlife removal company, offering pigeon and bird control services. We aren't a pest control or pigeon and bird exterminator company. We provide humane pigeon and bird trapping and prevention, and a completely solution to your Houston pigeon and bird problem. With spring come the birds that are looking to build their new home and raise their babies. Most birds will return to the same area where they were nesting the year before. Depending on the bird species, some can become a nuisance and bring problems to your home. If this is the case you probably want to know how to get rid of birds in a house. The birds that are considered pests are the European Starling, House Sparrow and Pigeons- all of which carry disease and mites. Birds like to nest in small areas that are protected such as eaves, holes in trees or if allowed access- your attic. Since the natural habitats for birds have declined due to cities expanding, the birds now look for any suitable place to nest. There is very little natural housing for the volume of starlings and sparrows as they have spread and multiplied throughout the United States to the millions. Because of this they have now taken up residence in homes and businesses. Both Starlings and House Sparrows are a non-native species to the United States and by their sheer numbers have displaced the native birds of North America. Although these little birds at first seem to be fun to have around they will multiple, as they draw other sparrows to them. The once few birds will turn out to be so many, that you will find nests in your siding and gutters, cracks in your house and anywhere they can find a nook to build their nest. Sparrows will chase off other birds by destroying their eggs and babies, saving the space for them. When you have such an influx of birds on your property there is opportunity for damage and illness. Sparrows are one of the few birds that the nest can be disturbed and moved at any time and it is recommended to have professional wildlife removers relocate these pests. Starlings were introduced in 1890 in New York and have grown to a whopping 200 million across the United States. These birds also gather into large groups and chase off natural bird life. They particularly like farms and ranches where there is plenty of food and water but can take up residence in houses and businesses alike. Both the Sparrows and Starlings can carry up to sixty parasites, fungi and viruses. The Starlings are known for spreading diseases from one location to another and become a health hazard if the bird population becomes too big. The first thing you’re going to want to think about before the actual removal is what type of bird problem do you have. Do you have areas that are being invaded and used as bird housing units? Are there multiple nests in your soffits or an entire flock living in your attic? This kind of problem is best fixed with your closing off all openings where nests can be made, using netting for soffit areas and securing the building. Although you can remove these nests legally you will want to have a professional wildlife removal company do this, as nests will carry disease and fungus not to mention are very difficult to get to. Many times your problem may be a simple lost bird in your home. In this case you may be tempted to get a net and try catching the bird. If you go this route you may end up with all sorts of damage to your home and a dead little bird on your hands. Truly if you have run up against issues with birds, hiring a professional service is the most effective way to get rid of birds in a house. This can be done safely with a removal service that specializes in various forms of nuisance wildlife. If you think you won’t need this service, you’ll want to remember the feces and the health hazards surrounding it- a wildlife removal service will help with this also.